Sweet potatoes are super autumnal, wintery, comforting, delicious... There is something about them that makes the perfect meal when it's chilly outside. No wonder they are used so much around the Christmas holidays. You can probably find thousands of recipes out there to put them into and every single one of them is amazing. 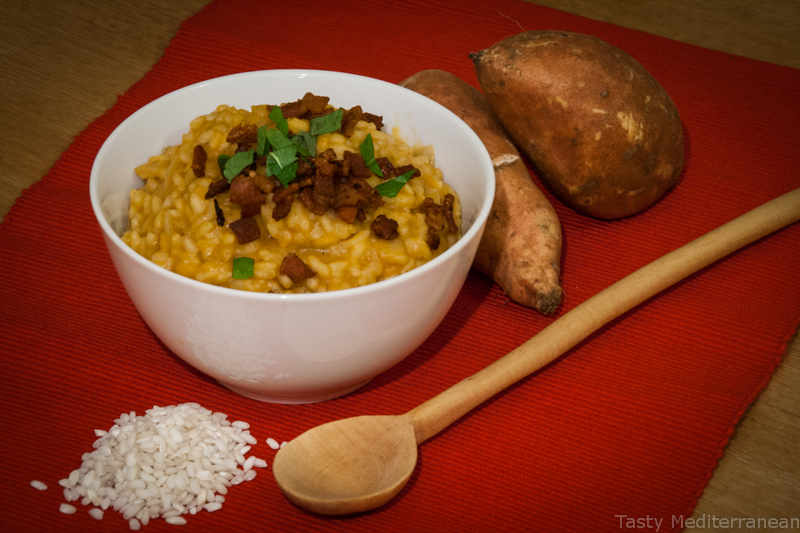 Tonight I was in a risotto mood... Bacon and onion risotto to be precise... But somehow I thought incorporating a few sweet potatoes wouldn't hurt. They definitely add to the richness of the meal and play up well against the saltiness of the bacon. - In a medium-sized pot add water and a generous amount of salt. Bring to the boil and add the potatoes in. Boil them until soft, then drain, mash, add paprika, nutmeg and salt to taste. Set aside. If you decide to roast the potatoes add the spices and enough olive oil to coat them and roast them is a 200 C preheated oven for 30min tossing them every 10min. Then mash and set aside. - In a skillet over a high heat, add the bacon and fry until crispy. Remove with a slotted spoon and set aside. - Add the onions in the bacon drippings. Sauté for 5min over medium-high heat. If the skillet is too dry add some olive oil. - Add the rice, give it a good stir to get coated by the olive oil, then add the wine. Deglaze the pan with a wooden spoon and stir until the wine is absorbed. - Ladle in chicken stock, stir and wait for it to get absorbed. Repeat this step for 18min. - After 18min, reduce the heat to medium-low and add the sweet potato mash. Stir well, check for seasoning, then serve on a warm plate with sprinkled crispy bacon and parsley. Enjoy!